If the Third World needs horsepower, Andre Bubear is determined that it will be healthy horsepower. NEIL CLARKSON meets the master saddler during a brief visit to New Zealand to wave the flag for the International League for the Protection of Horses. John Perrin: making the world better for working horses. Machinery may now drive New Zealand, but around the world an estimated 100 million horses, donkeys, and mules still power Third World economies. 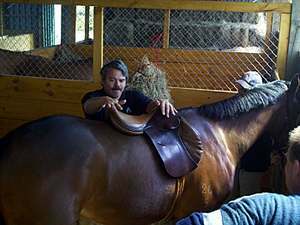 Andre Bubear at work checking the fit of a jumping saddle to a young horse. 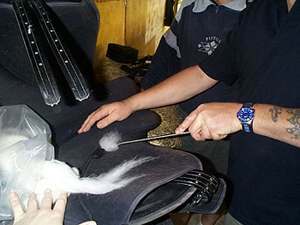 John Perrin adds some stuffing to a Wintec saddle. John Perrin and Andre Bubear saw a variety of backs at the clinic in Canterbury, including a horse with a broken wither, top, and a horse with a very high wither, below. John Perrin discusses saddling options with an owner. Andre Bubear looks for some sensitive spots before checking a dressage saddle for fit. 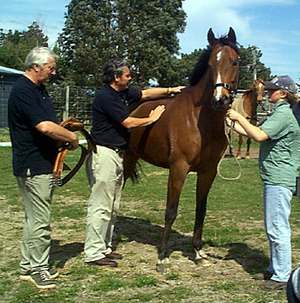 Andre Bubear and John Perrin look over a young jumper before seeing how the saddle fits. A broken-down indian saddle -- its trees was made from rubbishy timber held together by second-rate metal. 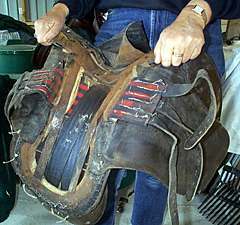 The trees on these saddles often spread and can be painful and uncomfortable for the horse. 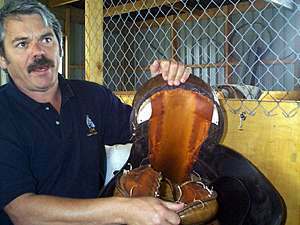 John Perrin makes sure the padding on a leather saddle is even after adding flocking. Andre Bubear makes an interesting discovery after taking a dressage saddle apart: pieces of white foam padding have been added to build up the back of the saddle. Building up a saddle in such a way is not recommended. English master saddler Andre Bubear travels the world as part of a dedicated team from the British-based International League for the Protection of Horses, helping to improve the lot of these animals. He was in New Zealand recently with fellow saddler John Perrin, en route to Fiji, where the league is putting in a big effort to improve the lot of working horses, of which an estimated 45,000 live on the main island alone. Mr Perrin is team leader for the league's work in Fiji and has already made five trips to the islands. Andre Bubear has been a saddler for 28 years, learning his craft in the British cavalry. He had been with the British army since he was a teenager, but decided the infantry wasn't for him, and in 1972 transferred to the Royal Horse Guards 1st Dragoons, where he first met Mr Perrin. The two are now brothers-in-law. Mr Bubear's interest in saddlery grew from this, and in 1979 he went into his regiment's saddlers' shop to learn the trade under John Perrin. He held several posts as a military saddler before, in 1985, he became the saddler for London's Metropolitan Police, which then had 270 horses. His interest in the International League for the Protection of Horses was sparked in 1990 when he was asked by travel writer Jeremy James to make some specialist tack for his journey across Eastern Europe. Mr James planned to write a book about his adventures, half the proceeds of which were to go to the league. Mr Bubear joined him for 600km as he rode across Romania, then considered the most dangerous part of the journey. During the trip they saw the number of horses still in use as working animals, and their plight. "Harnessing was poor, ill-fitting, badly maintained, and in some cases very badly made." 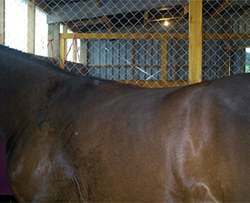 He was asked if he would be interested in joining the league's overseas training team, then comprising just a farrier and vet. 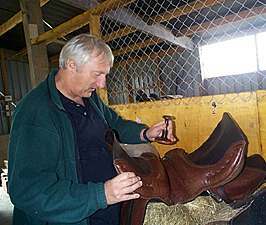 He began joining training trips � his first was to Jordan � and in 1993 he became the organisation's fulltime master saddler. In Jordan, he found trekking horses being injured by broken-down old English saddles donated by well-meaning Britons. He took apart a traditional Bedouin saddle and taught locals how to make them for a fraction of the cost of buying them. Tourists are now borne about Jordan on traditional saddles. Andre Bubear has since travelled the world helping to educate people in the care of horses. Countries like Britain and New Zealand, he says, are horse-loving nations, but many Third World countries which rely on workhorses do not know how to care for them. 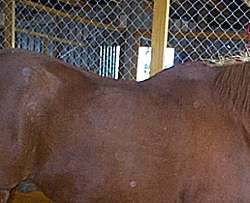 He has since travelled to Morocco, Mexico, Fiji, El Salvador, Egypt, Pakistan, Romania, Vietnam, Kenya, Honduras, and Guatemala in the cause of horse welfare. The league's overseas training programme aims to educate local people to a level where they can begin training countrymen themselves. 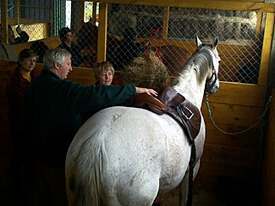 They now cover foot care, saddlery, horse nutrition, and management, running all their courses at village level. The success of overseas programmes depends very much on local support. Ethiopia, for example, proved difficult because of the nation's huge bureaucracy. Staff even had to hire tables and chairs where students could work. Fiji, on the other hand, offers valuable support through its Ministry of Agriculture. Andre Bubear says many people believe the poor treatment of horses in many Third World countries is cruelty, but it is mostly ignorance: using ill-fitting gear, poor shoeing practices, and a lack of knowledge about nutrition and management. Management can often involve little things, such as removing stones from stable floors, or removing nails from trees � they can take out a horse's eyes. His travels have shown him the best of horse care, and the worst. In Pakistan, horses and donkeys are required to carry between 4000 and 6000 bricks a day away from kilns. Their handlers must survive on $NZ1.50 a day, feeding and clothing their families, and caring for seven to 10 animals. "He has nothing. It's easy for us to criticise. It would be great to go to these countries with the very best harness and pack system you can think of, but you can't because they haven't got the wherewithal to buy it. We have got to work within their cultures." There are about 120 million working horses, donkeys, and mules in the world today; only 20 million of them are sport horses. The rest provide Third World economies with much-needed transport, often with inadequate nutrition, poor-fitting gear, and bad working conditions. Poor horse care does not necessarily run hand in hand with poverty, Andre Bubear says. He visited the northern provinces of Vietnam, where locals use ponies, and was delighted with what he found. "They are horse people, and those little ponies were crackers. Far from giving them advice, we learnt from them. How these people could keep horses in the mountains with zero grazing, maintain their harnessing and gear, and their ponies, is absolutely amazing." 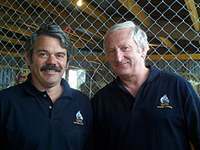 Andre Bubear and John Perrin have travelled the country with the ILPH's (www.horsetalk.co.nz/ilph) New Zealand administrator Marilyn Bright, talking with saddlers, running saddle clinics for horse owners, and checking horses and gear at trekking operations around the country. Marilyn Bright describes trekking horses as the working horses of New Zealand, and the league offers accreditation to those it considers meet good levels of horse care. There are an estimated 120 trekking centres in New Zealand. Andre Bubear says he and his colleagues would not be travelling around the world if there was not a need. The league has so far been asked by 30 countries to help in the care of horses. And so the campaign for healthy horsepower continues.